Where possible, I have also linked to the feed for these sites to help you be updated of new templates as they become available. I hope this resource list will be useful for you too! In this section you will find links to sites which provide (or collate) free Blogger XML based layouts. 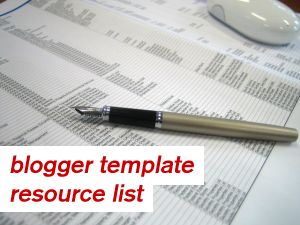 This is the ultimate directory of Blogger XML templates. At the time of writing this post, BTemplates features over 200 free Blogger XML layouts for free download, contributed by many different designers from the Blogger community. Templates are organized by theme, style and also by tags which makes it very easy to search for the style of template you prefer. One of the oldest and best known Blogger template resources, which also features useful customization articles for Blogger. Templates are organized by category, and there is also a search funtion to help narrow down your preferences. Blog and Web provide an excellent array of Blogger templates which have been converted from popular Wordpress designs. This site is written in Spanish, though you can easily translate the page you are reading using Babelfish Translator if you need to. Zona Cerebral features some of the most beautiful free Blogger templates I have ever seen. This site is also written in Spanish and can be translated quickly using Altavista's Babelfish translator if necessary. Jackbook provides a range of Blogger templates which have been converted from existing Wordpress templates. A wide variety of well-designed Blogger XML templates are available on this useful blog resource site. Final Sense probably has the largest collection of Blogger templates available. Some excellent designs to be found on this Blogger hosted resource site. The template used by K2 Modify is available for download, which is probably one of the best this site has to offer. Some beautiful, quirky and feminine designs to be found on this site. Many include customizable header images so you can add your own blog title to the design. Gisele's designs are beautiful, feminine and unique! GosuBlogger converts and creates Blogger XML templates. Be sure to visit to see some truly unique designs. Annie has created some beautiful Blogger templates for free download. Here you will also find some very useful articles about blogging with Google Blogger. A collection of free Blogger XML skins which are easily viewable on the home page. A great selection of Wordpress conversions, many of which can be seen on the front page. A directory with over 130 free Blogger templates available to download. Fans of Gecko and Fly's Classic Blogger templates have converted these to XML format which you can download from this site. This site features both original and Wordpress conversions for Blogger XML users. Updated regularly with new templates being uploaded often. In this section, you will find links to free Classic Blogger templates which you can download for free. There are some exceptional classic templates on this site, including many Ajax-driven designs with extra functionality. A wide selection of classic Blogger templates available on this colorful resource site. Loads of free classic templates available here. You can download and view many of these from the home page. This site features some well designed classic templates (plus a small selection for XML users too). Here you will find an excellent selection of classic template designs. All templates are listed in the sidebar, and there are some true gems to be found on this site! If you're looking for beautiful, feminine classic Blogger templates, this site is a must! Here are some rather unusual and striking classic templates for free download. Another collection of unique and inspiring designs. There is a huge selection of user-submitted classic templates for Blogger on this site. You will need to search through to find your ideal template though! If you're looking for a unique Blogger template design, you can hire the services of a template designer. Here are links to designers who cater for Blogger bloggers. Fees will vary between designers and the complexity of the design you require. This is probably the most popular site for custom designed Blogger templates. You can see many examples of Se7en's work in the portfolio section and prices start at $65 for a simple, two column design. Everyday Design is a favorite among women Bloggers. Everyday Mommy's designs are simple, striking and easy to navigate. Lunastone has produced some awesome Blogger powered designs which you can view in the portfolio section. Prices start from $50 for a Blogger design, though only classic Blogger templates are available. As the title suggests, this designer creates feminine and sassy designs especially for Blogger bloggers. Unique custom designed templates are available to order, and you can also choose from pre-made designs. Judith specializes in eye-catching designs which reflect the personality and voice of the personal blogger. She does have rather a long waiting list (which exemplifies the quality of her design work). Gisele offers custom designs for Blogger and Wordpress as well as her free Blogger templates. The professional designers of Ewebscapes can offer you a wholly unique and very well-designed template for your Blogger hosted blog. If you host a directory of Blogger templates, or are a professional designer who can cater to Blogger users, please drop me a line and I will add your site to this list. I hope you have found this to be a useful resource for all your template needs. If you have enjoyed this post, please subscribe to the full text feed to receive new articles, resources and Blogger news. A New Interface for Blogger Widgets Gadgets! The Stylish Way to Show Off Your Feed Count! Top Commenter's Widget for Blogger Blogs!